Concord Township residents will have the opportunity to receive a new mailbox marker courtesy of the trustees and a local volunteer. 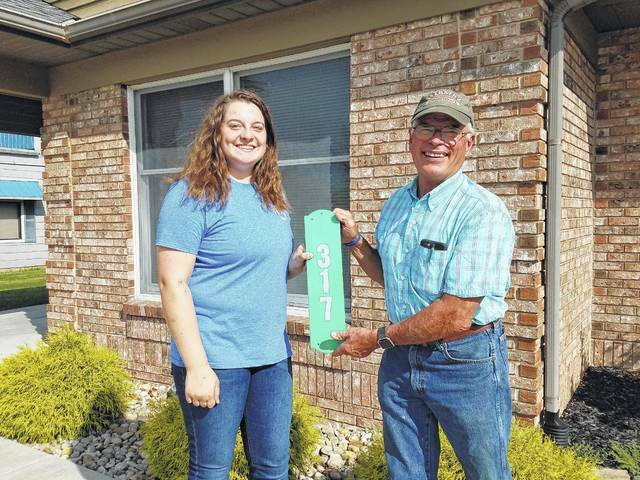 Gretchen Ivers, a Miami Trace High School student and Future Farmers of America (FFA) member, in an attempt to earn her state FFA degree, is volunteering her time to help bring easily readable numbers to the residents of Concord Township. After assembling a green metallic sign with white, reflective numbers, Ivers will find residents who do not have identifying marks on their home and place these signs on their mailboxes. The signs, according to Ivers and Garland, will allow first responders to find some homes easier, will allow people to find relatives easier on country roads, and will even help mail carriers ensure accurate deliveries. Ivers’ family has a long history of serving the community as her father, grandfather and great-grandfather all served as firefighters for many years. Currently her father, Gene Ivers, serves at the Washington Court House Municipal Court as bailiff and chief probation officer. She said she was excited to get started and even assembled her first sign for her own home. “It feels really good to be giving back to the community,” Ivers said. Gretchen Ivers (at left) will be volunteering to bring mailbox signs to Concord Township homes that currently do not have one. These signs will allow first responders to find some homes easier, among other benefits. Concord Township Trustee Jim Garland is also pictured. https://www.recordherald.com/wp-content/uploads/sites/27/2017/08/web1_20170822_170646.jpgGretchen Ivers (at left) will be volunteering to bring mailbox signs to Concord Township homes that currently do not have one. These signs will allow first responders to find some homes easier, among other benefits. Concord Township Trustee Jim Garland is also pictured.